Jeff Gordon started 24th in the Napa 500 and needed a 32nd or better finish to clinch the Winston Cup Championship. Gordon went right to the front early on and led 31 laps. Gordon and Earnhardt Jr battled a strong Ricky Craven in hair raising style like it was the last lap of the race. Gordon also had a few close calls in the pits with Ricky Craven and Johnny Benson but Jeff radioed in and was saying he was actually having some fun out there. The most dominant car had to be Dale Earnhardt Jr, who led the most laps, but he did not win the race. This race ran green pretty much all day except for a few cautions. On lap 264 all the cars came in for their last stops of the day. Fuel would turn out to be crucial in this race. Jerry Nadeau, Bobby Labonte and Dale Jr. were the top three cars at this point. Jeff was hanging around the top ten just waiting for the adjustments made to come in. On the restart these three engaged in a great side by side battle, with Labonte and Nadeau eventually passing Earnhardt Jr. Then Nadeau caught Labonte and set sail into the sunset. Then on the last half of lap, Jeffy Nadeau's worst nightmare happened. He was out of gas a half mile from the finish! He shook the car vigorously but Labonte passed him before he could get to the finish line. 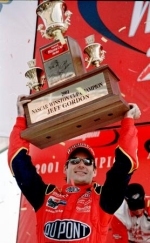 Nadeau ended up 4th but the big story was Jeff Gordon. He had just clinched the title by finishing a strong 6th place. While Gordon and Labonte pulled into a victory lane of their own, Nadeau was pushed by a recker truck to the garage. "It was tough -- I expected to win," said Nadeau, who eventually finished fourth. "We had a fast car, great stops. It's just too bad that we ran out of fuel. I'm not sure why (that happened). It's just so unfortunate for our guys. "We were probably pulling less gear than anyone else out there was, so we should've gotten better fuel mileage. There's one more race this year. Hopefully we'll win that one"
Bobby Labonte climbed out of his car a little somber but still extremely happy for the good luck that had just fallen on him. "Somebody said something about him maybe running out of gas on the radio," Labonte said of Nadeau's cruel fate. "I didn't think that was going to be my luck. ...I didn't know that he was really going to run out." This was Labonte's second win of the season and was a nice way for him to end the 2001 season. While Labonte was celebrating in Victory lane, Jeff Gordon made a championship victory lane of his own on the frontstretch of the speedway. An eccstatic Gordon climbed from his car pumping his fists and high fiving the crew! He then gave, one of the most touching speeches we have heard all year in my opinion. "I want to say what a true class act and champion Ricky Rudd, Dale Jarrett, Sterling Marlin, Tony Stewart, all those guys that we battled with for this championship. What a battle it was. All the guys in the DuPont Chevrolet team, they just were incredible this year. They were flawless in the way they prepared these race cars and the way they performed on pit road. The way the engines performed-- that was a back up engine (in the NAPA 500) and you'd never known it today. I want to thank Robbie Loomis it's his first championship. We're really proud to have him on board and give him his first championship as well as a lot of other guys on this DuPont team. Brian Whitesell.... there are so many guys who are crucial to this championship. I want to thank all the fans. I especially want to thank DuPont-- all the folks at DuPont have been great this year. The guys who are giving us the big check right here, RJ Reynolds and Winston. They're great partners of ours and we just love being a part of this awesome sport and it wouldn't happen without all these fans. "Every time I hear that number four-- four championships just boggles my mind," Gordon said after the race. "I can't believe it but I didn't do it alone. I did it with every member of this race team. They came together and said they wanted to be champions and they proved it. Through the grace of God we were able to do this together as a team. To get through a lot of adversity from last year and just build on that and become a much stronger team this year and come out and win the championship. (Last year) we were testing our patience quite often but I said all year long that the year we had (in 2000) is what made us champions this year. If you don't go through some tough times along the way then you really never find out what exactly you're made of. You can say all day long that you're champions through the tough times and good times, but until you go through it and do it like that and come back and be champions. There were a lot of critics who didn't think we could come back and do it and I'm just awful proud to come back and put this thing up front all year long. And win races-- big races-- and then come here and do it in the fashion we did today is a good, strong finish." Now unlike most seasons, this was not the last race. They still have to go to New Hampshire and race this Friday because it was cancelled because of the September 11 attacks. Jeff will look to add another win to his impressive season and look to relax and have a little fun now that the title is his.